It turns out I had bid Former Yugoslavia goodbye too early a few days before, as I adjusted my route so that I could take in a bit of the Former Yugoslav Republic of Macedonia – which is perhaps the country that indicates most clearly which nation it used to belong to. 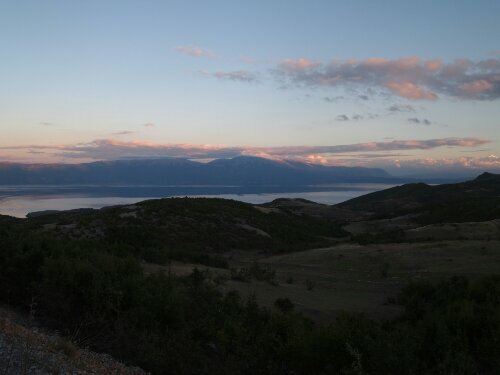 Lake Ohrid was beautiful though, surrounded as it was by mountains. Not quite as incredible as Kotor had been but worth the journey. 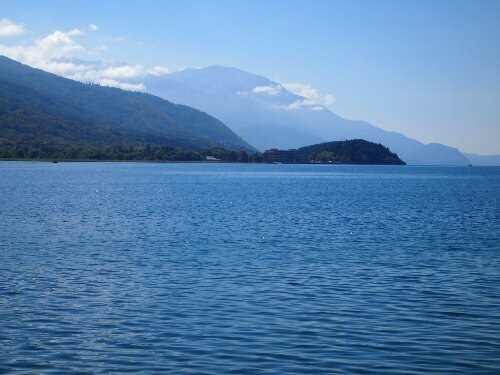 The next day I had a nice relaxing ride round the lake through Struga and to Ohrid itself. Ohrid disappointed somewhat – the location was pretty but not amazing and most of the sights seemed to be up a really really steep cobbled hill. This was not the most fun to get up with a fully loaded touring bike. Also the castle at the top wasn’t really that great either and I felt hard done by. I did get some Macedonian money in the town and this is by the prettiest money I have seen. Very bright looking – shame it isn’t worth much… see here for pictures. After Ohrid it was another ride up and out of the lake the valley sat in – again up to 1000m and into another valley where the town of Resen was located. This place must have had a particularly clement climate as apples seemed to be being grown everywhere. When I stopped to buy some from a lady by the side of the road she wouldn’t take my money and ended up giving me three different types of apple. This was great except the green one was massive and must have weighed half a kilo on its own. Weighed down with fruit I rode for Bitola where I stopped the night in a hotel. This was a proper Macedonian city with more than one street and a bit of bustle. 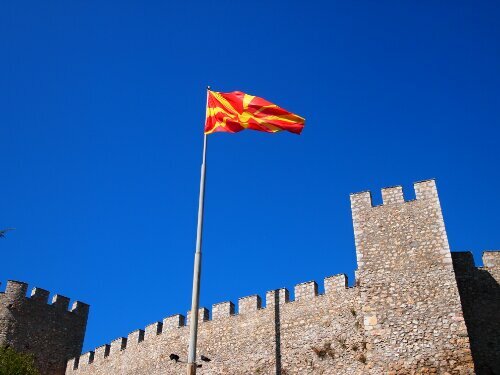 Apparently it is the most European of Macedonian towns as there used to be a lot of consulates there. It was certainly a nice place to spend the evening and was very cheap. 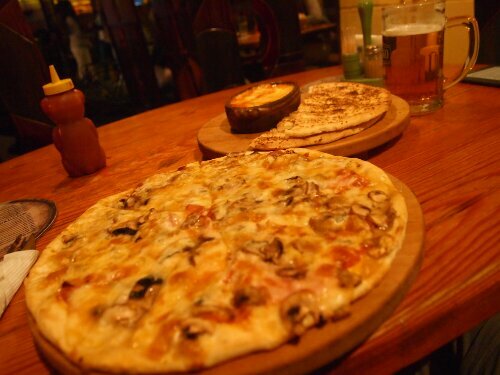 I got a pizza, a beer and a bowl of melted cheese with bread for about GBP 6. After Bitola I headed for Greece and crossed the border near Niki with no incident. Once in Greece it seemed to get hotter and quieter immediately. Arriving on a Sunday in the north of Greece felt like a scene from 28 Days Later. There was hardly anyone around – barely any cars, barely any people. There didn’t seem to be many shops open or otherwise. It wasn’t until I’d ridden about 70km to Edessa that I found anything like civilisation and this was in the form of an old lady in a shop whom I’m sure ripped me off. I ended up paying EUR 5.30 for a drink and a multipack of yogurts, which was about EUR 3 too much I’m sure. I wanted that yogurt though and I’d already bought it before any sense of injustice could kick in. After Edessa I rode hard for Giannitsa where I planned to wild camp near. 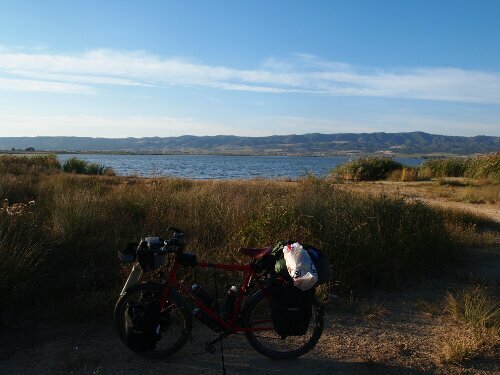 Prior to Giannitsa it had mostly been quiet countryside and small villages after it was one long industrial zone – not the best place for wild camping. The fields were planted with cotton as well which is not something you can really camp amongst. As it was getting dark I gave up and checked into the first cheap hotel I could find. I was missing Macedonia already. The next day the industrial zone continued up until Thesalonniki – it was a really unpleasant ride with nothing to see but factories and with trucks flying past. Some parts of the road were great with massive hard shoulders others had none. It was also very hot again. Arriving in Thesalonniki I decided to have lunch and a quick look round. 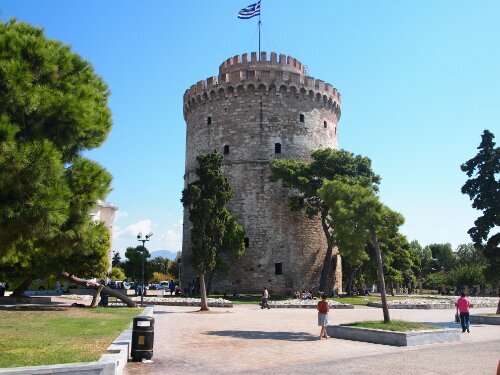 This I did – I didn’t see much of note apart from the White Tower of Thesalonniki right on the sea. Once at the top I shot down towards some lakes, the first of which looked a bit dried out – the second: Lake Volvi was still looking very beautiful and it was here I decided to stop. I ended up wild camping on the slopes above the lake which was really rather pretty. The next day I made it to Nea Kavali and I stayed in a campsite right on the ocean with a view of the island of Thassos. This was fortunate as the campsite marked on my map looked like it had closed down quite some time ago. After Nea Kavali I headed to Komotini, a small town of little note but quite close to the Turkish Border, which I would be crossing soon.